Redoubt Reporter file photo. The Alaska Board of Game updated regulations for moose hunting at its meeting in Anchorage last week. As Alaska Board of Game members heard last week, it’s good news, bad news regarding the moose population on the Kenai Peninsula. The board met March 13 through 18 in Anchorage to consider Southcentral proposals, including several measures related to moose hunting on the Kenai Peninsula. The board got to peninsula moose measures March 17, starting with a presentation by Jeff Selinger, area wildlife biologist for the Alaska Department of Fish and Game. The peninsula is divided into Game Management Units 7, on the eastern peninsula, and 15A on the northwestern peninsula, 15B in the central western peninsula, and 15C in the southwestern peninsula. While moose aren’t going great guns in any of those units — and, therefore, neither is moose hunting — some areas are doing better than others. “We believe 15A is still in decline. Fifteen B is kind of a wait and see due to the large fire that occurred there, and 15C we believe we’re stable and maybe, possibly increasing slightly. And in Unit 7 we think we are still having declining moose populations,” Selinger said. Fish and Game says that habitat is the single biggest limiting factor on the peninsula’s moose population. Forests have matured beyond the point of providing good moose browse, but some areas have been rejuvenated by wildfire. Area 15C has seen several fires in recent years, including the Fox Creek River Fire in 2005, and the Caribou Hills burn in 2007. Last year’s Funny River Fire torched almost 200,000 acres in area 15B, but 15C — home to the most human development — hasn’t had a major wildfire for decades. The Board of Game enacted an intensive management plan for moose in 15A in 2012, which was revised in 2013. It includes aerial and ground-based wolf predator control measures, and a habitat improvement project. Three female wolves were taken in predator control in 2014, and none have been killed this year. The habitat improvement project happened in late winter and spring of 2013, with about 85 acres being cleared and 1,000 birch saplings planted. It’s too soon to really gauge the impact of these measures, but no obvious improvements have yet occurred. 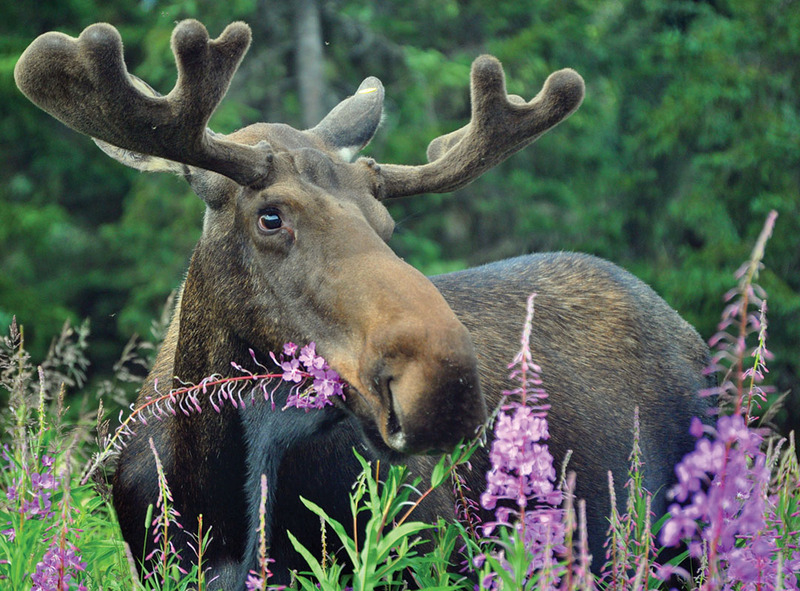 The Board of Game has enacted increasing moose harvest restrictions on the peninsula over the years to improve the overall moose population, as well as calf-to-cow and bull-to-cow ratios. And a slate of moose proposals faced board members this go-around. The general hunting season for moose in units 7 and 15 changed to Sept. 1 to Sept. 25. A measure to open a Sept. 1 to Sept. 25 moose hunt for nonresidents in Unit 15C was approved. An antlerless moose hunt in Unit 15C, the DM 549 draw permit hunt, open to residents and nonresidents, had its dates changed to Oct. 20 through Nov. 20. A proposal to change the bag limit in Units 7 and 15 to bull moose with an antler spread of 50 inches or greater or three or more brow tines on one side, failed. The current harvest restriction will remain in place, with bulls with 50-inch or greater antlers or four brow tines on a side, and spike moose. Eliminating all early and late season start dates for weapons-restricted hunts in Unit 15 failed. As did a proposal to open a seven-day archery season following the general season in Units 7 and 15. And a new registration hunt from Oct. 15 to March 31 in Unit 15C was created, to target problem moose in high vehicle-moose collision stretches of road during the winter.